Bitcoins are taking over the crypto-currency marketplace and are one of the best ways to preserve one’s privacy. They’re now the largest and most well-known digital currency. As one of the leading private label email providers, we are happy to launch our support for bitcoin payments (in beta). Users can use bitcoins for payment of premium plans on different public sites www.email.fr, www.mail.be, www.mailfence.com and www.contactoffice.com. In line with our philosophy of giving full control and ease of use to the user, we also offer to pay with credit card or Paypal. Interested in discovering one of our premium plans? Log into your account. Click on your name at the top right of the screen and click on ‘Subscriptions’. You’ll discover the different plans. 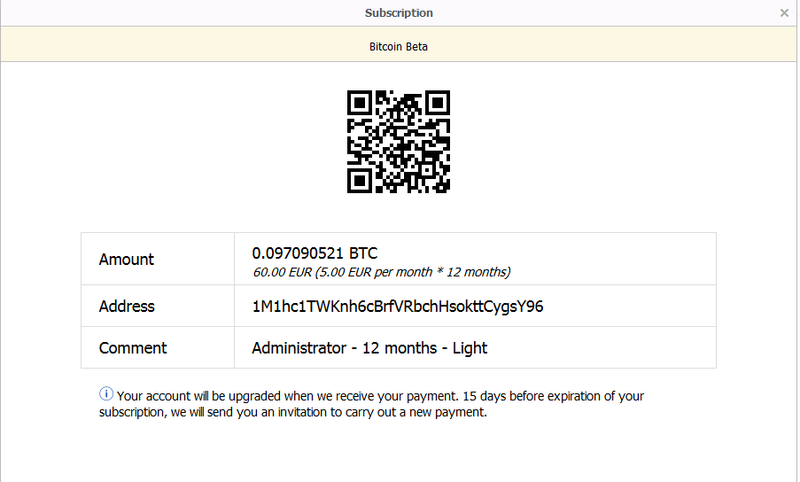 Select the subscription of your choice and click on the Bitcoin icon at the bottom right. Click on Next and you’ll discover the following screen with bitcoin payment instructions.